This piece was commissioned by Stephen Williams, director of the Chapter House Choir. Stephen asked for three interlocking pieces which would, to a degree, be independent of each other while also working together. He also suggested the Siegfried Sassoon poem Everyone sang, acknowledging that the concert date is near to Remembrance Sunday and that it would be proper to commemorate the continuing anniversary of the First World War. To this end I have used the famous phrases from the Laurence Binyon poem For the Fallen which could be sung as almost a plainsong mantra by the Youth Choir. The words from the Latin Mass which petition for peace (dona nobis pacem) seemed like the obvious text for the Chapter House Choir. Thank you, Stephen and the choir, for asking me to write a carol for the Chapter House Choir’s fiftieth Carols by Candlelight. Feeling particularly grateful that both the choir and its erstwhile conductor have weathered the passage of time, I wanted to write a Thanks be to God! offering in my favourite form, while exploring some of the rich sonorities which the present choir excel in. The Benedicamus refrain came to me at once, last January, and was then put aside in the hope that a text would evolve. Within the traditional framework of stanza and refrain I decided on the simplicity of a single rhyme to overarch the whole. Again, in common with very many Christmas texts, I wanted at a time of celebration to reflect on the less fortunate in our world. Come Spirit is a ten-minute accessible gospel / modern jazz choral work for choir and jazz trio that was commissioned by the Chapter House Choir. The work is a resetting of two Pentecostal hymns: the familiar ‘Come Down O Love Divine‘ and the less well known ‘Holy Spirit, Truth Divine‘. This was tremendous fun to compose. The nature of the texts and associated musical ideas and styles seemed to demand a more expansive approach for full development, and to allow for some structural compositional weaving between the two. This was also encouraged by the exciting combination of choral and instrumental forces. With the jazz trio being such a compact yet self-sufficient musical unit, capable of setting up both rhythmic groove and the harmonic framework, there is plenty of scope and choice as to how the choir can be employed. When I asked the poet Robin Leanse if he had any poems about World War I, he wrote to me to say that he was on holiday and had been walking by the Somme. There he was reminded of a Rimbaud sonnet about Rimbaud finding a dead soldier in a beautiful landscape, during the Franco-Prussian war in 1870. He immediately wrote a poem as a response to the Rimbaud, which points ahead to the thousand upon thousand of men who would die in similar fields, 40 odd years later. It struck me that the two poems would go together very well, and Robin kindly made a beautiful English translation of the Rimbaud. The music is in two definite halves as well, portraying the sensual and impressionistic beauty of the Rimbaud, and then the more gestural and saddened response of the Leanse. Premièred by the Chapter House Choir, together with other choirs from the route of the Tour de France Grand Départ in Yorkshire, in York Minster. 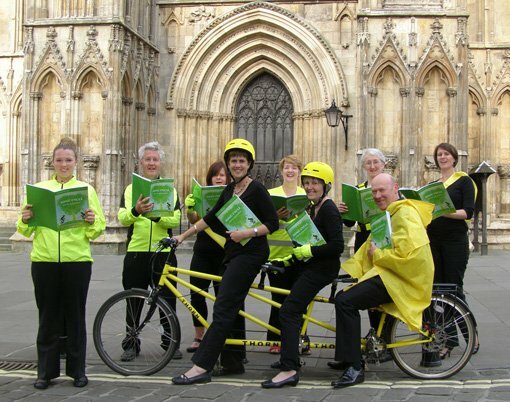 In 2014 The Chapter House Choir was delighted to be able to commission the amazing British composer Alexander L’Estrange to create a new choral cantata for the cultural festival happening to coincide with the Tour de France Grand Départ in Yorkshire. 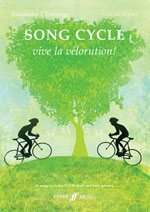 The commission Song Cycle: vive la vélorution! is a 45-minute joyous creation for massed choirs and jazz quintet celebrating the thrill of the great outdoors, cycling and the history and development of the bicycle. It is an absolute tour de force that takes singers and audience on a whimsical ride through a huge range of popular music styles including jazz, music hall, and folk accompanied by jazz quintet, bicycle bells, pumps and horns. The première performance, in partnership with York Minster, took place in a packed Nave of York Minster on 28 June 2014. The performance involved 340 amateur choral singers from across Yorkshire, accompanied by the Call Me Al Jazz Quintet, and was conducted by the Chapter House Choir’s Musical Director, Stephen Williams. The huge combined choir sounded magnificent! …… The organisation by the CHC, and the good-humoured, fun but efficient atmosphere they created. Stephen Williams musically organised and conducted the whole thing brilliantly. He, Claire Duckworth and all the CHC team were a pleasure to work with throughout…… I enjoyed the challenge of York Minster and feel I did a good job musically. This was also the first time I had collaborated with my wife (lyricist Joanna Forbes L’Estrange) on a large-scale piece, and we both enjoyed the experience hugely. The vocal score has recently been published by Faber so that this fabulous fun-filled work can be performed and enjoyed by choirs and audiences world-wide. See the Song Cycle website for further details, demo tracks and links to how you might hire the score and perform Song Cycle yourself! These beautiful lines, from Tennyson’s extended elegy to his friend Arthur Hallam, reflect a paradoxical feeling of both absence and presence which were felt in the months following Clare’s loss and, though deeply coloured by sadness, it was our privilege to commission Gabriel Jackson to set them. The first three stanzas of In Memoriam begin with different ‘voices’, the ethereal (Sopranos and Altos), the more earthly (tenors and Basses) and the intensely personal (unison voices), each rising to widely spaced (though densely packed) chordal arches of great radiance. The poetry is given its final intensification in a radical change. The paradox, iterated line-by-line, is given in dialogue to two solo voices who alternate toward a conclusion left hanging in the air. I do not therefore love thee less. I shall hear your music singing me to sleep.